A view of Pampa Texas taken in the 1920's. Taken off the Pampa Web. Incidentally, one of the finest museums in all of Texas is the White Deer Land Museum.The next time you are in or near Pampa, make plans to visit this fantastic museum. When you go there, ask for Anne Davidson who is the curator, and she will take you on a tour you will NEVER forget! The museum's home is in the 80 year old restored Land Office Building, dedicated to the early pioneers and to the Western heritage of Texas and Gray County. Guided tours are available Tuesday through Sunday from 1 to 4 PM. Special tours are arranged by appointment. The museum is located at 116 S. Culyer, Pampa, Texas 79065. Phone number is (806) 669-8041. 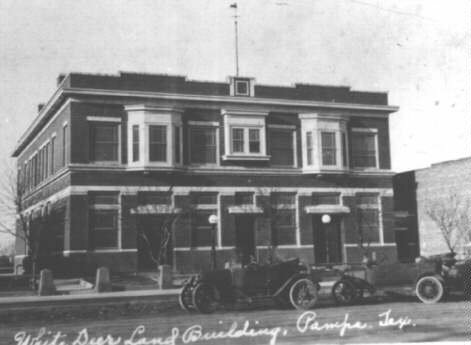 Also, I have found a great net site for Pampa.Go to Pampa Texas Internet This is really an excellent site and has some great photos of the early days of Pampa. Also, go to the Pampa page and read the Pampa News and visit the Pampa Independent School District!